The TLS Shires on the Avenues project is now in its third year of management on the Ham Avenues. At the end of May/beginning of June – Operation Centaur (Shire Horses team housed at Richmond Park and Hampton Court) work with the TLS to carry out a hay cut on the Avenues. Helped by corporate volunteers arranged in partnership with the National Trust the work provides a sensitive management of the grasses along the historic 17th Century landscape around Ham House. The volunteers cut areas unreachable by mowers and the horses walk up and down the avenues pulling traditional cutting tools that trim the grass twice a year (once in the early summer and once again at the end of summer (Sept/October). 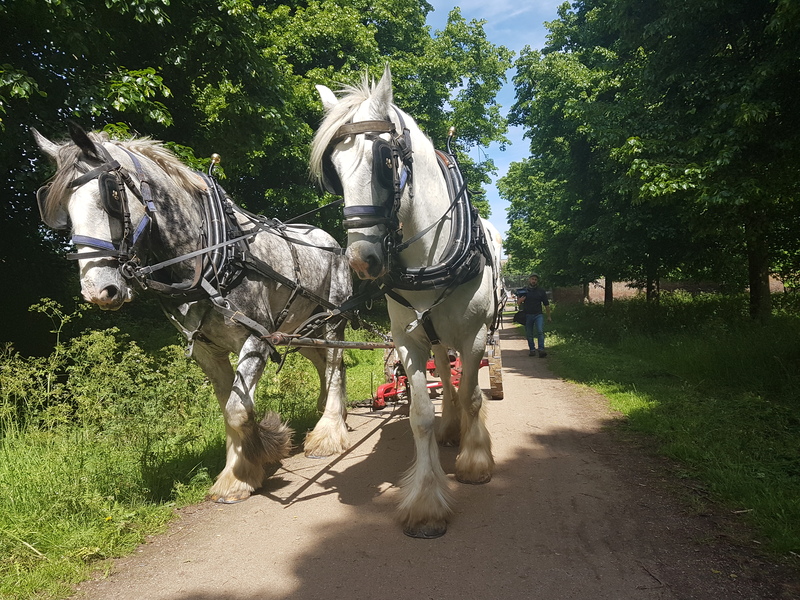 The horses are more sensitive the ground than modern machines and are much more in keeping with the traditional aesthetics of the landscape – managing it in a way that would be similar to how areas of this period would of been managed for hundreds of years – with horse and man power. A beautiful photographic exhibition and accompanying book (forward by HRH Prince Charles) has been produced by Paul Stewart following a year in the life of the Shire team “The Last Herd”. It includes projects carried out with the TLS as well as other environmental and education programmes run by Operation Centaur. Information about the book and how to order prints can be found at www.photographyintoart.co.uk 20% of profits from the sales go back to Operation Centaur to help them to keep this rare breed alive and working. It is still an aspiration of the TLS and Operation Centaur that more parts of the TLS area can be managed in this way with small projects taking place in Elmbridge and along the riverbank. Funding and sponsorship is continuously being sought for this work, please contact the Becky rebecca.law@richmond.gov.uk if you have any suggestions or would like to make a donation to the ongoing partnership between the TLS and Operation Centaur.